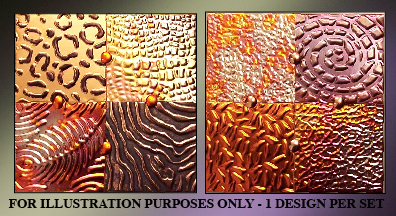 Our products are hand crafted from copper sheet, foil and mesh, all torch painted to create a spectacular array of color and pattern. Cutting, weaving and texturing make each piece even more unique. Hand-lacquered copper edges retain their beauty for years with no polishing, however, please hand wash only. Coordinating display tower (page bottom) makes your coasters a 3D work of art when not in use. Our web host currently does not allow for a 'shopping cart'. Single items, or multiples of a single style, can be ordered by clicking the Buy Now button. If you would like multiple styles shipped to the same address and would prefer to do a single purchase, please go to the Contact Us page and indicate the item names/quanities. You will be sent a Paypal invoice for those items and combined shipping. We appologize for the inconvenience and are in the process of changing to a program which will accommodate our expanding sales! * International Purchasers: Shipping charged is for US addresses only; purchasers from outside the US will be notified of the additional shipping cost before receiving a PayPal invoice to cover it. Coordinating display tower available - see page bottom. Handcut and textured copper strips, each with a unique torch patina, are woven together and sealed between sheets of crystal clear glass for years of enjoyment. Copper edging is hand-lacquered so no polishing is needed. Clear rubber feet on each 4 inch square coaster prevent slipping. Set of four tied with organza ribbon and descriptive hang tag. A wonderful gift (seventh anniversary is copper) $39. Coordinating display tower available - see bottom of page. Matching frame available on frame page. Matching 4x6 frame available on frame page. 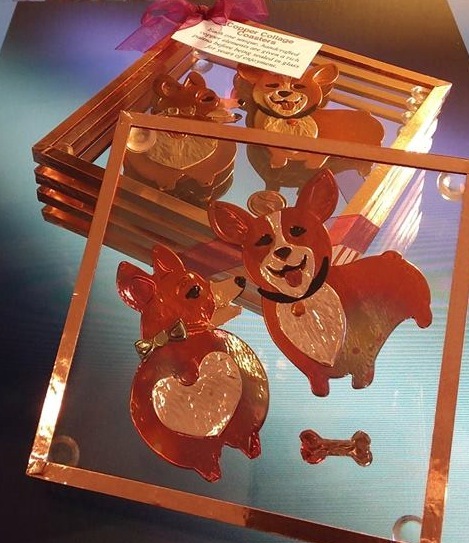 Handcrafted copper corgis, each with a unique patina, frolic happily between sheets of crystal clear glass with gleaming copper edges (hand lacquered to prevent tarnishing). Clear rubber feet on each 4 inch coaster to prevent slipping. Steampunk elements including gears and keys, handcrafted in copper with unique patinas and textures. Sealed between crystal clear glass with gleaming copper edges (hand laquered - do not require polishing) Amazing effect when stacked! Clear rubber feet on each 4 inch square coaster prevent slipping. Four unique patinas, textures and/or embossings fitted together and "riveted" with coordinating studs. Sealed between sheets of crystal clear glass for years of enjoyment, edges lacquered to prevent tarnishing. Clear rubber feet on each 4 inch square coaster prevent slipping. 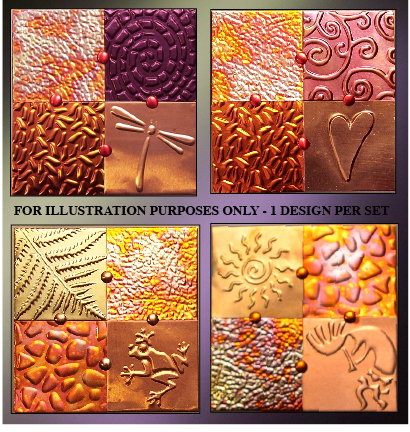 Stunning gift for wedding, anniversary (7th is copper), housewarming or other occasion!